PennDOT has been in the business of snow removal for 100 years. It's no easy task — we couldn't do it without the dedication and hard work of our snow plow drivers and other maintenance staff. In an old Department of Highways ad from around 1966, a narrator puts it best, "When (snow) happens this winter, there is something you ought to keep in mind. Somebody out there loves you. Who is he? Well, he's not just one man. 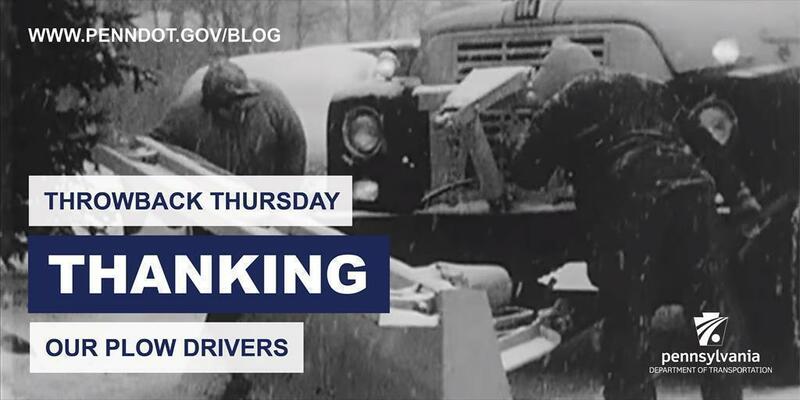 Thousands of Pennsylvania Department of Highways personnel get out of warm beds and go on duty when a snow storm or a blizzard strikes." Then there's current snow plow driver Mike Gonzalez, who says, "I take pride myself in being a snow plow driver because I know I'm keeping my family safe, the motoring public safe. Providing that to me is fulfilling that they know that they can trust us. That we're out there for them and provide that kind of service. It feels good." So, if you know a snow plow driver, or see one out on the roads, please give them a big thank you. Interested in becoming one of our snow removal heroes? PennDOT is hiring for our Winter Maintenance Program. Visit www.employment.pa.gov to apply.